What Is A "Hoosier" Cabinet? This question is asked by many people, because today there are fewer and fewer individuals who remember using a "Hoosier" kitchen cabinet. In their day though, one of these cabinets could be found in a large percentage of homes in the United States. Some were even shipped around the world. bread drawers, spice jars, pot and pan racks and many other features for the "modern, efficient kitchen." Few home makers today know what cooking was like in the early 1900's. Back then the typical housewife spent a great deal of her time in the kitchen baking bread, pies, cakes and making meals from scratch. Using 50 pounds of flour in a short period of time was not unusual, and the reason for such large flour bins. "Hoosier" cabinets were built by many different manufacturers. As such, "Hoosier" is a generic term, derived both from the name of the largest maker of these units, The Hoosier Manufacturing Company of New Castle, Indiana, and from the fact that almost all of these cabinet makers were located in the "Hoosier" state of Indiana. The Hoosier Manufacturing Company founded in 1898, had built more than two million cabinets by 1920. Since there were only about 20 million households in the United States in 1921, nearly 10% had a kitchen cabinet with the name Hoosier on it. And there were many other manufacturers. The second largest was G.I. Sellers and Sons, located in ElIwood, Indiana. Other brands included Boone, McDougall, Napanee, Kitchen Maid and Wilson. At one time there were about thirty manufacturers making "Hoosier" style kitchen cabinets, most in Indiana. 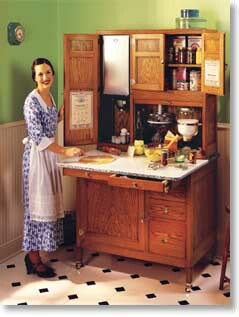 By the 1930's, the advent of built-in kitchen cabinets caused the demand for free-standing Hoosier" cabinets to decline. Many manufacturers went out of business, although The Hoosier Manufacturing Company continued in operation until 1940. Today only one company survives, the original builders of Napanee Dutch Kitchenets, another style of "Hoosier." The Coppes Company in Nappanee, Indiana, now makes only modem custom-built cabinets. Many people have now discovered "Hoosier" cabinets, and quite a few have taken steps to preserve this part of Americana. Once left rotting in barns and sold for pocket change, "Hoosier" cabinets have become quite sought after and are harder and harder to find. A completely restored oak Hoosier cabinet can now command a price in the thousands of dollars. A fully functional "Hoosier" cabinet is truly a sight to behold, and a source of constant conversation. Once you see one close up, you won't soon forget the impression it makes. "Indiana Cabinets Including Hoosier, Sellers,McDougall, Napanee, Etc."